"A mother worried about her college daughter's drinking, makes a desperate attempt to reach out by becoming a binge drinker herself." Have you ever wanted to go on a drinking binge or work for minimum wage? How about live with a family that has drastically different religious beliefs than yours? While most of us would answer "no" to these questions, I have a feeling the answer would change if in 30 days, everything could go right back to normal, with no repercussions. That's the fantasy brought forth by the man behind the hit documentary Super Size Me, Morgan Spurlock, in his new TV series, 30 Days. After a successful six-episode first season, Spurlock's back for a second season of "what if" scenarios on the FX network. It remains to be seen if those upcoming shows can top what we get in 30 Days: Season 1. The six-episode first season begins with Minimum Wage. Spurlock shows off his producer smarts by placing himself (and his fianc�e, Alexandra) at the center of the episode. This allows viewers to get comfortable with the format by relating to his familiar face. Spurlock and Alex move to Ohio, taking only as many clothes as will fit in a backpack, and set out to find a job that will pay them a mere $5.15 an hour. The result is the perfect way to begin a new show, as the wide range of emotions and inevitable strain that is put on this loving couple's relationship makes it difficult to turn away. We can't help but feel the pair's pain as they are forced to live in a beaten down apartment, and break down while buying their food and everyday supplies from a Goodwill-type store. Unfortunately, setting the bar so high this early on could have proven extremely costly to the rest of the season. Thankfully, that isn't the case, as Spurlock and company keep things going strong in Anti-Aging. Ringing true to this era of performance-enhancing drugs, we follow a thirtysomething man (not Spurlock this time) on his quest to reacquire the younger version of his body. While everything goes well at first, his body eventually shows some negative side effects, and he questions just how important such a body is. Religion takes center-stage in Muslims in America, the only one of the six episodes I could have done without. Accepting beliefs different than our own is always an interesting concept, but the Christian/Muslim dynamic in this case never really gels. Straight Man in a Gay World takes a very intriguing look at a heterosexual male living with a gay man in San Francisco. The former, Ryan, has a classic deer-in-the-headlights look on his face the minute he arrives in his temporary home, and, despite some truly awakening moments, he (realistically) never quite fits in. Still, Ryan's attitude changes dramatically during the course of his stay, and he makes some truly compelling comments when it's time to head home. A pair of city people living in an Ecovillage in Missouri might not be everyone's cup of tea, but the pentultimate episode, Off the Grid, has its moments. It's the season finale, Binge Drinking Mom, that impresses most. It's involving enough that we instantly hate the alcoholic teenage daughter, but when we see what lengths her mom will go to to help her girl, it's downright sad. One might argue that the mom might go too far on occasion, but regardless, she cares enough to put herself through pure hell to prove her point. Each episode has a similar style and format to Super Size Me, right down to the funny animated sequences that provide background information. The most appealing aspects, however, are the video diary sequences. While these are a staple in nearly every reality show, you'll be hard-pressed to find more enjoyable segments. The personal, candid reflections, especially in Minimum Wage, draw the viewer directly into the participants' abnormal situations. Garnering just the right amount of pathos from the audience, these diaries are the special ingredients that make 30 Days such a success. Nearly all of 30 Days: Season 1 is a resounding success, but if we get more accounts like Binge Drinking Mom in the second group of episodes, this series will be here to stay. Image Transfer Review: Presented in their original full frame formats, these six episodes look good, but aren't exactly demo worthy. The various filming methods (usually involving hand-held cameras) yield up-and-down image quality. Colors are muted, and shadow and contrast levels waver at times, but again, this is a show about real people in real situations, shot in a gritty, you-are-there style, so most of the visual deficiencies are easily forgiven. Audio Transfer Review: The Dolby Digital 2.0 audio tracks are equally passable. There are never any problems that make it difficult to hear the dialogue or other sounds. Everything stays up front, but these mixes do their job by delivering realistic sounds throughout each episode. The Lost Diarycams - Unused footage from each episode. Extras Review: There aren't many extra features, but each episode is given more than its fair shake in the supplemental material. There are audio commentaries for four of the six shows, with a wide variety of participants. The best of the lot is the Minimum Wage track, mainly due to Spurlock's involvement, and his willingness to divulge a slew of details about his experience. There is also a series of lost diarycam footage for each episode. While these were cut from the final product, the reason behind such trimming had to be for time considerations, as much of it is very interesting. Riding the wave of his Super Size Me success, documentary filmmaker Morgan Spurlock saw his first TV show hit the airwaves in 2005. 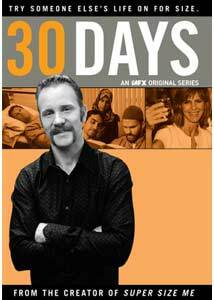 30 Days: Season 1 hits DVD courtesy of Fox, and this two-disc offering is quite impressive. While the audio and video are broadcast quality, the extensive extras are a wonderful surprise, and hopefully, a sign of good things to come in future season sets.